Future Energy Systems PhD Candidate Stephanie Chute-Ibsen at work in the lab identifying invertebrates. Imagine a town has been wiped out by a natural disaster. The government hires contractors to rebuild the homes and businesses that have been lost, and a few years later gleaming new structures have risen from the ashes. Government inspectors wander through the streets, count the number of new buildings and give the stamp of approval: the community is restored. Except the inspectors are alone on those streets. No one has moved back into these new buildings. It’s a ghost town. Is the community truly restored if no one is living in it? If no one has come back, is the government using the right criteria to judge success? Stephanie Chute-Ibsen, a PhD candidate working with Dr. Anne Naeth in the Future Energy Systems Land and Water theme, is asking questions like those, but instead of a hypothetical community she’s studying real sites being reclaimed after human-caused disruptions, and instead of counting families in houses she’s counting tiny creatures that live beneath our feet. Her idea recently captured the imagination of the UAlberta Falling Walls Lab jury, so this November she’s bound for Berlin to spread awareness about invertebrates. Insects, arachnids, and worms all fall into the category of invertebrates –– inverts to their friends –– and they’re a sensitive bunch. Though people often perceive ‘bugs’ to be omnipresent, these tiny creatures can be quite selective about the soils they choose to live in. When they choose not to live in a certain area it could indicate that the living conditions are poor, and their absence could leave the site vulnerable. 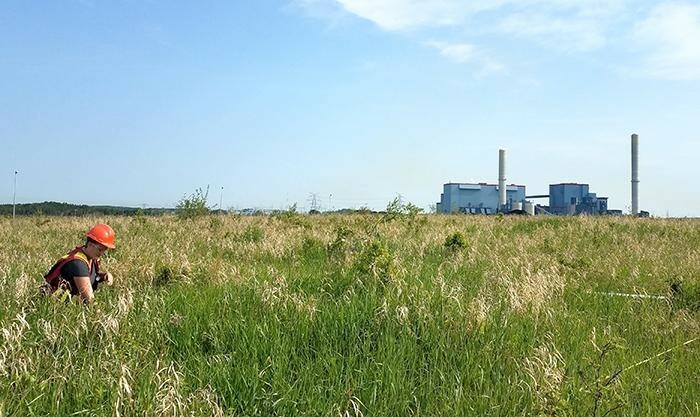 This is an important consideration when land is being reclaimed after disruptions –– particularly at sites like strip coal mines. Inverts have an important part to play in establishing that resilience because they have incredibly high diversity and play numerous functional roles. They contribute organic matter which affects soil fertility, aid in soil structure formation, and affect the availability of resources for other organisms including plants and microorganisms. Without a functioning invert community invasive pests can move in, endangering the health of that site and even the surrounding ecosystems. Understanding invertebrate populations may be vital to successful land reclamation –– but it’s difficult to do. To get started, you need to know a lot about invertebrates. Stephanie has been interested in bugs for as long as she can remember. Her home office hosts an extensive insect collection, many taken from the Edmonton river valley. She has pinned butterflies, beetles, and even a flea. 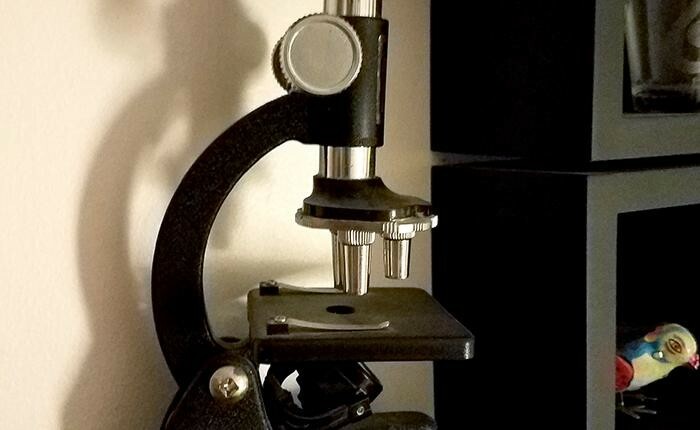 The microscope she received at the age of 9 –– prior to moving to Canada from Germany –– has a place of honor in her living room. Admittedly, her affinity for inverts unsettles some people. But this passion, combined with a profound concern about the future of the environment, led her to take on the laborious challenge of studying invert populations at reclamation sites. 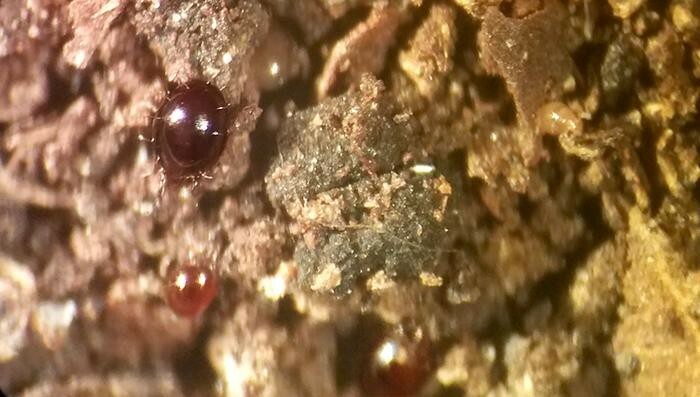 Tiny mites –– many barely visible to the naked eye –– are some of the most important indicators of soil health. When extracted from a soil sample, a few types are large enough to be categorized on sight, but most have to be made into slides so that their acarological family can be determined. That meticulous, four-day process involves specially gluing them to a glass slide in a certain position so that specific features are visible, then curing them. After they’ve been prepared each one has to be checked under a microscope, and Stephanie is the only one on her team with the invert expertise to do the categorization. She recently enhanced that knowledge by attending the intensive, world-leading three-week Soil Acarology Summer Program at Ohio State University this summer. “I absolutely love learning about mites, though you can definitely go bug-eyed,” she jokes (she’s an unapologetic lover of science puns). Stephanie is currently in her second year of collecting samples at the Westmoreland Coal Company Genesee Mine, 80 kilometers west of Edmonton. To gather the inverts she uses two methods: pitfall traps and litter and soil core samples containing live specimens. The pitfall traps are simple plastic deli containers placed in holes and left for one week, capturing all surface dwelling invertebrates. The litter and soil core samples are taken to the Royal Alberta Museum. There Stephanie employs the Tullgren funnel extraction method, which uses light bulbs to gradually heat the samples from top to bottom, creating a temperature and moisture gradient. As the inverts within the sample migrate down to avoid baking, they’re collected for counting and categorization. In addition to these samples, she assesses the soil and vegetation, which allow her to see how the sites would be rated based on current conventional metrics of land reclamation. Returning to the metaphor of the rebuilt town, she’s counting buildings while also conducting a census. Her question is whether the buildings and the people correlate. If outside observers see a rebuilt town putting up skyscrapers, can they conclude that there are enough people to fill them? If the town had never been disturbed in the first place, it could be safe to assume enough people lived there to warrant the construction, but when an outside agent is responsible for construction, it’s more difficult to determine whether demand is balanced with supply. She’s willing to put in the effort to find out. It will be a few years –– thousands of slides of mites –– before Stephanie can publish any conclusions about the importance of measuring invertebrates. If she does conclude that monitoring those populations is important, the finding will be the beginning of a lot more work. Those tools would include clear assessments of what invert populations are best suited to restore soil health, and what reclamation practices and techniques are likely to regenerate those populations. Since the role of inverts in reclamation has rarely been studied, the list of things to learn is long –– but Stephanie doesn’t mind. Her plan is to become a Professor, carrying on with invert-related research and sharing her passion for the tiny creatures with new generations of students and the broader public. 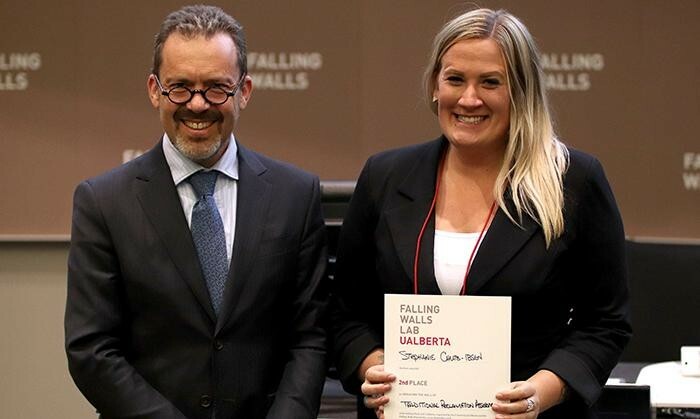 She’s off to a good start: at the University of Alberta’s fifth Falling Walls Lab, a qualifier for the international research competition that’s billed as a cross between a three-minute thesis and a TED Talk, her pitch ranked second out of the final fifteen –– bested only by a potential cure for cancer. That’s the message she’ll take with her to Germany, where she’ll represent the University of Alberta and Future Energy Systems in the international Falling Walls competition. To learn more about Stephanie's project within Resilient Reclaimed Land and Water Systems, click here.